Everyone knows that cats love catnip, but why? Catnip is actually a flowering plant that pleasantly stimulates cats’ pheromonic receptors when cats sense its bruised leaves or stems, commonly resulting in temporary euphoria. It may cause cats to paw at it, chew it, lick it, leap about and purr, or salivate. About two-thirds of cats are susceptible to catnip because of heredity; others do not react to it. 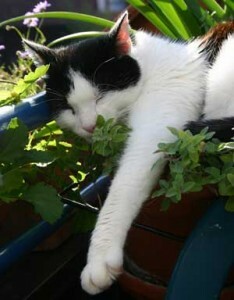 Because catnip is a plant, and you want the very best for your cat, you should buy only 100% organically grown catnip. This means your cat won’t be exposed to any harmful pesticides that were used to grow the catnip. Also, look for toys that are completely stuffed with catnip and not supplemented with cotton fill or lesser grade catnip. If you buy better quality catnip, it will last longer and your cat will be much happier!